This winery is named for the Oregon Trail, which rewarded 19th century explorers with the fertile land of the Willamette Valley. The valley was under 400 feet of water a much earlier point in history, with volcanic soil and marine deposits carried to it over time. The winery promises ripe fruit and minimal intervention in the cellar with their Pinot Noir. 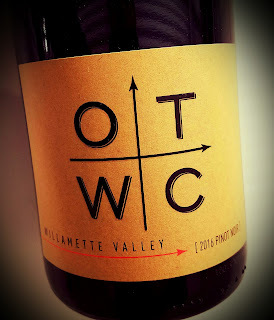 The 2016 Oregon Trail Wine Company Pinot Noir carries alcohol at 13.2% abv and sells for about $20, pretty reasonable for a good Pinot - very reasonable for a great one. You'll hear the word "Burgundian" tossed about a bit when Oregon Pinot Noir is talked about, and this wine is a good example of why. The wine is medium dark in the glass with a gorgeous nose of smoky, red fruit. Bright cherries have the shade of earth thrown over them with an overlay of sage. 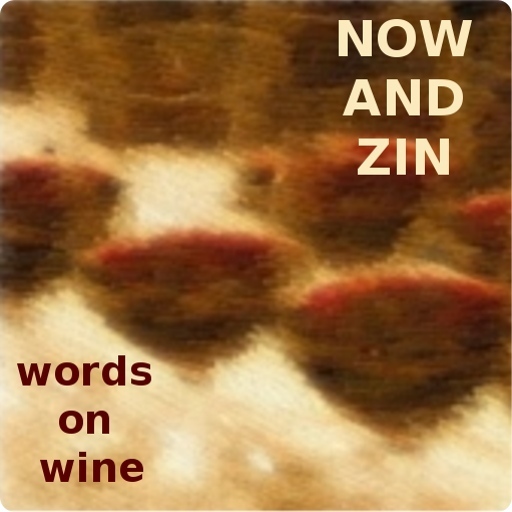 In the mouth, tannins are firm and acidity is great and the palate is ripe and a bit savory. It's a bold wine, but the brawn is kept in check. At no time did I think I might possibly be drinking a Syrah. It's a middleweight, right where Pinot ought to be. 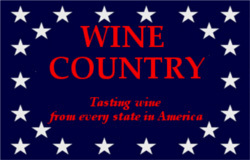 There's wine from all 50 states. 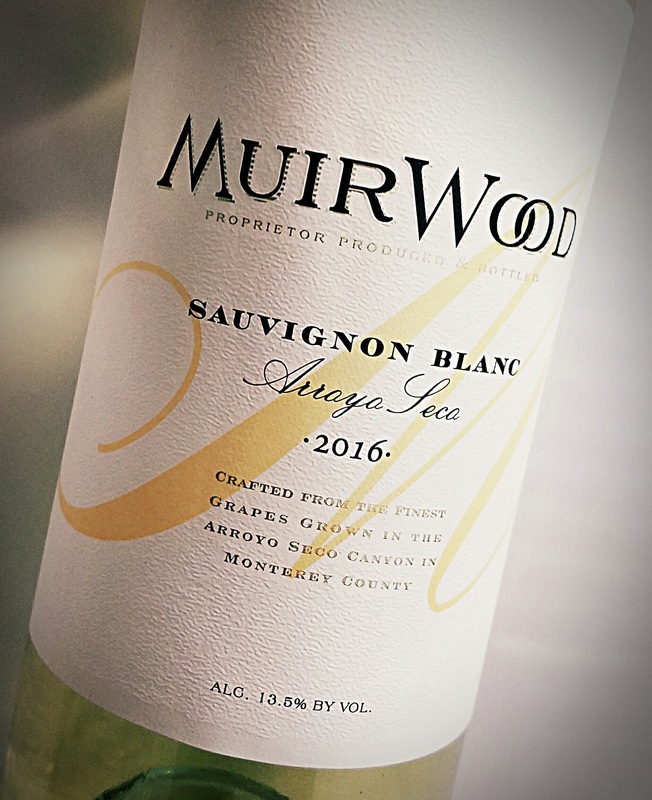 The 2016 MuirWood Sauvignon Blanc grapes were grown in their Suter Vineyard estate plot in the Arroyo Seco Canyon. They are the Musqué clone of the variety, and as such offer more aromatics, typically with a lean to fruit, away from the vegetal aspect for which the grape is known. Surprises abound, though. The wine hits 13.9% abv on the alcohol meter and sells for about $15. 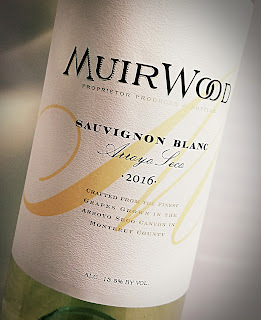 The nose this wine offers is unlike any I've experienced with Sauvignon Blanc, even of the Musqué variety. There are apple notes and flower aromas, but an overriding smokiness - muskiness? - lends a savory effect. The acidity is zippy but not mind-blowing, and the weight is medium full, like a Chardonnay. It's an extremely satisfying drink, and one of the more impressive of the variety that I've tasted. Sauvignon Blanc generally means spring to me, but this would be great next to a Thanksgiving ham. Randall Grahm's Bonny Doon Vineyard is a serious wine company. He's a serious winemaker who makes serious wines. His sense of humor, though, is not that of a dour, soulless number cruncher. I get the feeling he's had to do a lot more of that kind of work in his career than he'd like, but he doesn’t let it bring him doon. 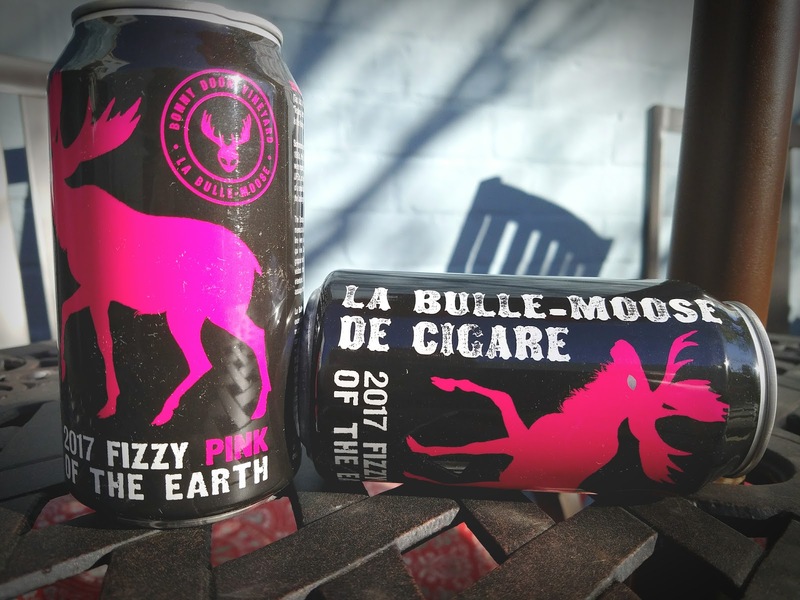 Grahm is now making a pink, fizzy wine that comes in a can, La Bulle-Moose de Cigare. 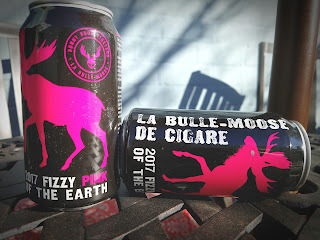 He describes the Bulle-Moose as "pretty darn similar to our Vin Gris de Cigare, apart from the fact that it has been carbonated and put up in cans with a slightly goofy label." It does look goofy, but the wine inside is seriously good. The press material for this wine includes a reworked version of the "UFOs in the vineyards" tale that was embraced by Grahm years ago for his line of Cigare wines. It's also on the can. Grahm admits that his canned, fizzy pink wine is a bit of a stretch for him -- he’s used to much more serious "vins de terroir." He says it's his tip of the hat to the realized fact that he's going to need some millennials hoisting his creations if the lights are to stay on at "chez doon." Six Central Coast grape varieties made their way into these stylish cans, 57% Grenache, 18% Grenache Blanc, 9% Mourvèdre, 6% Roussanne, 5% Carignane and 5% Cinsault. That’s quite a Rhônish roundup. It was fermented in stainless steel, on the lees, stirred quite a bit and carbonated before bottling, er - canning. Alcohol is light enough for a picnic or outdoor festival at 13% abv and the wine retails for $8 a can, which contains a half bottle. The wine -- from a can -- pours up frothy, retreating quickly to a nice frizzante status. The nose is beautiful and worthy of a picnic. Bright, fresh strawberry and cherry aromas dominate, with a touch of sage and earth. The flavors are ripe and sweet, with an earthy touch befitting a good rosé. Acidity is perfect, great for food pairing as well as sipping. The winemaker suggests you serve it very cold, and that will make it a great summertime wine. Grahm puts tongue in cheek to recommend La Bulle-Moose de Cigare be paired with moossaka, moozarella crostini, moosseline de poisson, tarte au pamplemoose and chocolate moose. A virtual wine tasting event was staged recently for Smith Story Wine Cellars. "Virtual tasting" is when a bunch of wine writers/tasters get together on social media and spend an hour or so letting technology link us with great people and wines. There are far worse ways to spend an hour. The winery says 2015 was an exceptional vintage for the Sonoma Mountain fruit. "The 2015 drought played a role. The high temperatures in August and early September accelerated maturity and picking times resulting in lively acidity, moderate to low alcohol and intense aromatics." 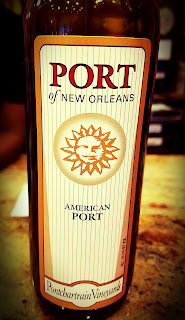 The wine was aged in neutral Bordeaux barrels for 21 months and it hits 14.2% abv. The retail price is $60, and it's that special. Only 300 cases were made. Virtual tasters liked the tart fruit and spiciness of this one. They also complimented its nose of roses, licorice, black pepper and eucalyptus. This Cab is very dark and offers up a beautiful nose of cassis, vanilla and sweet oak. There's a very slight herbal tinge and suggestion of smoke. The palate shows blackberry, blueberry and a bit of bramble. The tannins are quite firm and will no doubt mature in years to come. 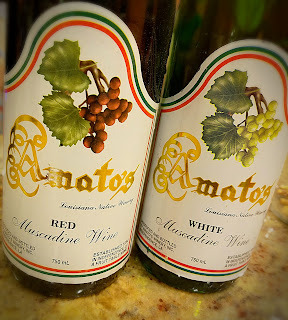 As it is, it's a wonderful wine that's ready for a grilled steak or portobello mushroom. 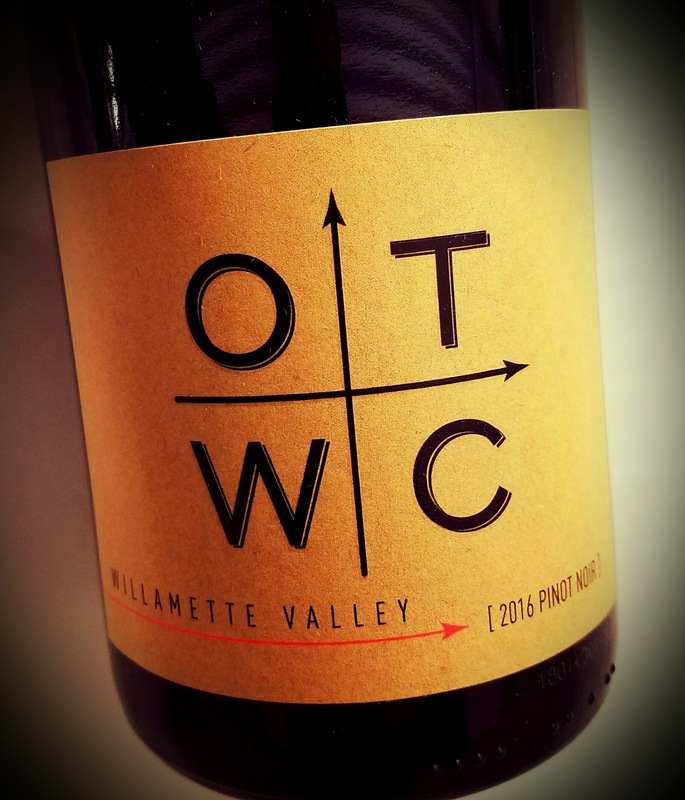 From Washington's Columbia Valley, the 2015 Pacific Crest Centennial Trail Chardonnay is named after the 2600-mile route that crosses some excellent wine regions as it winds its way across the western U.S. The Chardonnay grapes for this wine grow in sandy loam on vines planted in 1981. 2015 was a warm Washington vintage, with riper fruit resulting from the sunshine. Winemaker Linda Trotta fermented the juice in steel and oak, and the barrels got an extra four months work aging the wine. The alcohol hits 13.2% abv and the wine sells for $17, very reasonable considering the quality. The wine sits pale yellow-green in the glass and smells of tropical fruit with quite a buttery overlay. The oak treatment rests in that place that's maybe a skosh too much, but a lot of people like it there. What saves the day is the ripeness of the fruit and the raciness of the acidity. Both come in heaping helpings. Papaya, guava, banana and pineapple all take a turn on the taste buds. The mouthfeel is full and the finish takes a long time. From the vaults, about six years back. They only made a hundred cases of this $100 wine, and it proved to be very popular. The website says the 2014 Howell Mountain Cab "sold out quickly at the winery." Unavailable for the moment, Cornerstone says a "limited vertical release of 2013, 2014 and 2015 will be available in November 2018." Get in line. Alcohol hits 14.6% abv. This wine is medium dark, dark at its core. Aromas of rich blackberries and cassis come blasting forward, with tobacco, smoke and anise in tow. There's a hint of something herbal - possibly eucalyptus? - poking through lightly. A medium heft in the mouth is joined by firm tannins and a racy acidity. It has a really clean palate, with dark berry and plum flavors not trod on too heavily by oak. 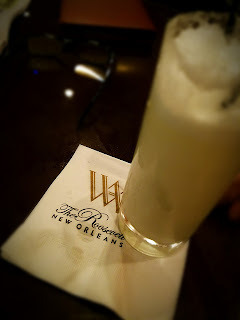 In search of classic New Orleans cocktails on a recent trip to the Crescent City, I happened into the beautiful Roosevelt Hotel Sazerac Bar. Expansive and done up in as much art deco as they could get their hands on, the bar is worthy of being included on a visitor's itinerary. Having already had a Sazerac at another French Quarter watering hole, I decided to go with what the bar describes as a New Orleans classic on its own, the Ramos Gin Fizz. Sweet and frothy with egg whites, the making of the drink allows the bartender to put on quite a show, shaking heavily and dripping the concoction into a tall glass from on high. The term "don't try this at home" does not apply, but you’ll likely need to bolster your bar first. All ingredients except the soda - gin, lemon juice, lime juice, egg white, sugar, cream and orange flower water - are poured into a mixing glass and shaken with no ice for two minutes. Then, ice is added and shaken hard for another minute. Think of it as an aerobics session for lushes. Then, strain it into a Collins glass and top with soda. Easy, right? They say it's the orange flower water and the egg whites that turn a regular gin fizz on its head and make it an entirely new beverage. The cocktail was reportedly created by Henry C. Ramos in 1888 at his Imperial Cabinet Saloon on Gravier Street. Back in the day it's said to have taken 12 minutes to make one, so a whole crew of 20 or more bartenders had to be on duty during peak hours just to shake it. The Roosevelt made the drink popular, and former Governor Huey P. Long liked it so much, they say he brought one of the hotel's bartenders to New York to teach another hotel's staff how to make it. Then the governor could enjoy it when was doing business in the Big Apple. 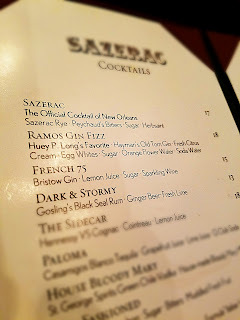 The Roosevelt Hotel owns the trademark to the name, Ramos Gin Fizz. Punch offers a scaled-down two-minute version of the Ramos Gin Fizz, if you're in a hurry to get your fizz on. An "encore presentation" from about 6 years back.